පළමුව Apache 2.2, MySQL 5 සහ PHP 5 පහත links වලින් බා ගත කර ගන්න. මෙය සාර්ථකව ස්ථාපනය වූ විට System Tray පෙදෙසේ Apache Services icon එක දැක ගත හැකි අතර එමගින් Apache Server එක ක්‍රියාත්මක කිරීම සහ ක්‍රියා විරහිත කිරීම සිදු කල හැක. එසේත් නැත්නම් Control Panel –> Administrative Tools –> Services මගින් එය වෙනස් කල හැක. දැන් web browser එකේ localhost ලෙස type කර enter කර බලන්න. Apache Server එක නිසියාකාරව ක්‍රියාත්මක වේ නම් It Works..!! ලෙස දැකිය හැක. දැනට ඔබගේ web sites C:\Program Files (x86)\Apache Software Foundation\Apache2.2\htdocs ආකාරයේ folder එකක ඇතුලත් කල යුතු අතර එය වෙනස් කිරීමට පහත පියවර අනුගමනය කරන්න. Apache ස්ථාපනය කල folder එක තුල ඇකි conf නම් folder එක open කරන්න. එහි ඇති httpd.conf නම් file එක admin privileges සහිතව open කර ගන්න. එය සිදු කරන අයුරු පහලින් දක්වා ඇත. <Directory “C:\Program Files (x86)\Apache Software Foundation\Apache2.2\htdocs”> හි ද C:/www ලෙස යොදන්න. දැන් MySQL ස්ථාපිත කර ගන්න. ඒ සඳහා විශේෂ දේවල් සිදු නොකල යුතු අතර සාමාන්‍ය මෘදුකාංගයක් ස්ථාපනය කරන අයුරින්ම මෙය සිදු කල හැක. එම folder එක තුල php5apache2_2.dll නම් file එක තිබේදැයි බලන්න. එසේ නොමැති වූ විට මෙම php සංස්කරණය Apache 2.2 සමඟ ක්‍රියාත්මක නොවේ. C:/PHP සහ C:/PHP/ext යන path දෙක system path එකට එකතු කරන්න. එය සිදු කරන අයුරු පහලින් දක්වා ඇත. C:\PHP\libmysql.dll යන file එක C:\WINDOWS\system32 ට copy කරන්න. දැන් එය admin privileges සහිතව open කර ගන්න. දැන් එය තුල doc_root යන්න සොයා එය සඳහා ඔබ DocumentRoot සඳහා ලබා දුන් path එක ලබා දෙන්න. extension_dir යන්න සොයා එය සඳහා C:/PHP/ext යන්න ලබා දෙන්න. ;extension=php_mysqli.dll යන්න සොයා එහි මුල ඇති ; ලකුණ ඉවත් කරන්න. එසේ පේළියක් නොමැති නම් අනෙක් extensions ලියා ඇති පේළි අතරට extension=php_mysqli.dll යන්න එකතු කරන්න. ;extension=php_mysql.dll යන්න සොයා එහි මුල ඇති ; ලකුණ ඉවත් කරන්න. file එකේ ඇති අවසන් LoadModule යෙදුමට පසුව පහත පේළි එකතු කරන්න. මෙහි C:/PHP යනු ඔබ කලින් PHP ස්ථාපනය කල ස්ථානයයි. එම file එකේම DirectoryIndex යන්න සොයා එහි අගට index.php5 index.php යන්න එකතු කරන්න. C:/www තුල test.php ලෙස file එකක් නිර්මාණය කර පහත පේළි ඇතුලත් කරන්න. මෙහි root යනු MySQL හි user name එකත් myPassword යනු එම user ගේ password එකත් වේ. ඒවා ඔබට සරිලන පරිදි වෙනස් කර ගන්න. දැන් web browser එකේ localhost/test.php ලෙස type කර enter කල විට, ඔබගේ වෑයම සාර්ථක නම් පහත අයුරින් output එකක් ලැබේ. මෙය errors ලබා දේ නම් පහත code එක පමණක් එම File එකේ ඇතුලත් කර output එක බලන්න. මෙය MySQL භාවිතා නොකර ක්‍රියාත්මක වන බැවින් මෙය නිසියාකාරයෙන් ක්‍රියාත්මක වේ නම් ඔබගේ MySQL ස්ථාපනයේ ගැටළුවක් ඇත. Control Panel –> System වෙත යන්න. වම් පසින් Advanced System Settings යන්න click කරන්න. එහි Advanced tab එකේ Environment variables යන්න click කරන්න. දැන් ලැබෙන window එකේ system variables යටතේ ඇති path යන්න double click කරන්න. එහි variable value සඳහා ඇති අගය අගින් ; මගින් වෙන් කරමින් අවශ්‍ය අලුත් අගයන් ලබා දෙන්න. මෙය Windows 7 සහ Windows 8 සඳහා පමණක් වලංගු වේ. 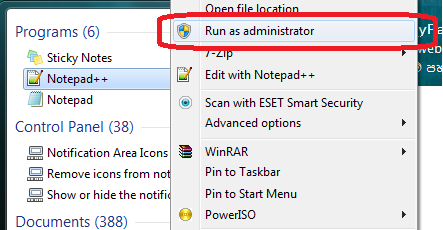 ඔබගේ text editor එකේ icon එක right click කර Run as administrator යන්න click කරන්න. පසුව එහි File—> Open මගින් අවශ්‍ය file එක open කර ගන්න.